Solid play for two days, a top stack from about 30 players down, Tom West improved on his 3rd place finish in the January 2015 HPT Main Event to defeat Nic Vu heads up and with the $154,590 top prize when his top pair on the flop held against Vu's flush draw. A limped pot and the flop is 7♦️2♠️5♦️, Tom West checks, 275,000 from Nic Vu and aWest first counts out a call, then he moves all in and Vu insta-calls. A 2♣️ and it is all over, .. Nic Vu collects $94,500 for second place. Here are the results (so far) for Event 10 - $1650 HPT Main Event - in the 2015 Players Championship Series. The turn T♠️ draws a check from West, a 300,000 bet by Vu with a check-call from West. On the 9♠️ river, West checks again, "600,000," Vu says aloud and West doesn't look happy about the bet but he makes the call. to 60000/120000, just 115 total BB in play now heads up between Tom West and Nic Vu. 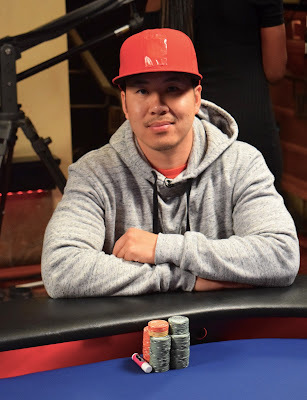 Nick Vu bets 250,000 on a Q-6-4 flop and West check-calls. Both players had a 7 so they chop it up and we start all over. Here's the @HPTPoker bracelet that winners get at each stop now. Tom West has 9,815,000 chips and Nic Vu 4,090,000 as we get ready for heads up play here. On a flop of Q-J-9 Randy Smith shoves and Tom West calls, having Smith covered. Bigger kicker for West and there's straight draws for both players. The 8 hits the turn for 2 pair for Smith but it hits West harder as he gets his straight. Tom West finished 3rd the last time @HPTPoker came to Thunder Valley, and here he is again with 3 remaining. Minh Nguyen is all in for his last 900,000 and Nic Vu makes the call. The board runs out 3♠️7♥️8♦️T♠️6♣️ and Nguyen is eliminated in 4th place, cashing for $43,553, just shy of the $48,000 he won last weekend in Event 1. Craig Gold moves all in and Nic Vu makes the call. 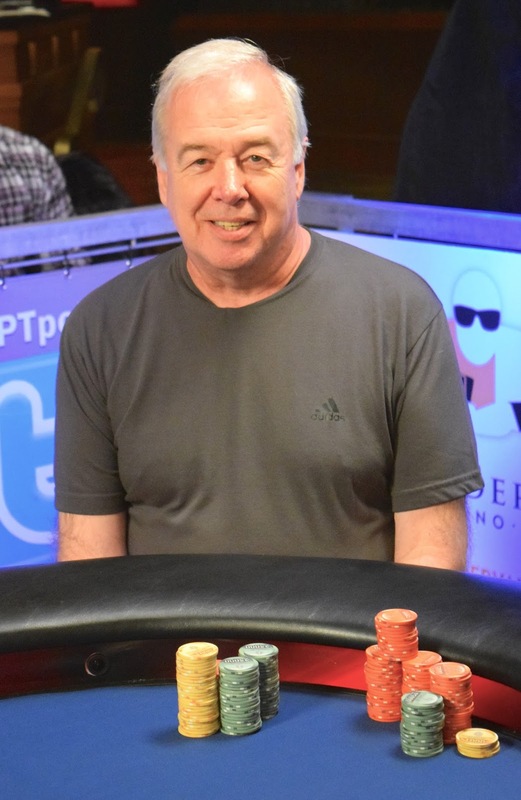 Craig Gold moves all in preflop and Tom West snap-undershoves for 1,655,000. The flop is 7♣️T♠️7♦️, while the turn A♠️ and river T♣️ keep West in front and he gets a full double from Gold to 3.4 million and Gold slips to slightly below 1 million. Adam Ghattas all in for his last 115,000 at blinds of 50000/100000 and Tom West calls, tehn Minh Nguyen reraises all in and West folds. K♠️5♦️6♣️3s♠️2♣️ and Ghattas is eliminated in 6th place, cashing for $25,205. Nguyen gets back to a milly. Here are chipcounts for the 6 players at the @HPTPoker Main Event Final Table as they head off on dinner break. Nic Vu and Adam Ghattas mix it up on the final hand before dinner break. 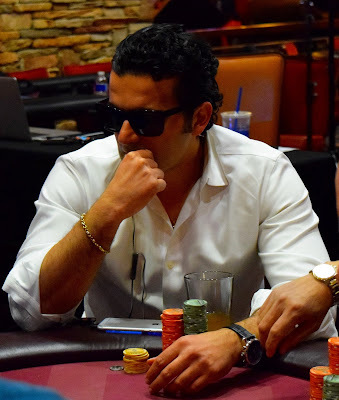 The board is 6-T-A andVu bets 600,000 on the 8 turn and Ghattas makes the call. The river is a 9 and Vu moves all in for his last 1,60,000. Ghattas asks for a count and calls, showing A9 for 2 pair. Vu shows 88 for a turned set and he's good. They count down the chips and Ghatts has some, we can't see how many, but its not much, ad we'll update chipcounts in just a moment. The remaining 6 players have headed off on a 45-minute dinner break (not the hour-long-break we first announced). We'll have chipcounts here in a few, but we need to order some broccoli beef first. On the very next hand Minh Nguyen moves all in for his last 465,000 and Nic Vu makes the call. There's an A and a Q in the window, plus a K for the flop, two pair for Nguyen, but that gives Vu a gutshot broadway draw. 6 on both the turn and river and just like that he's back to more than a milly. Minh Nguyen moves all in preflop and Craig Gold undershoves for 1,575,000. But the case J hits the river for quads .. and Gold moves to what should be the chiplead now. 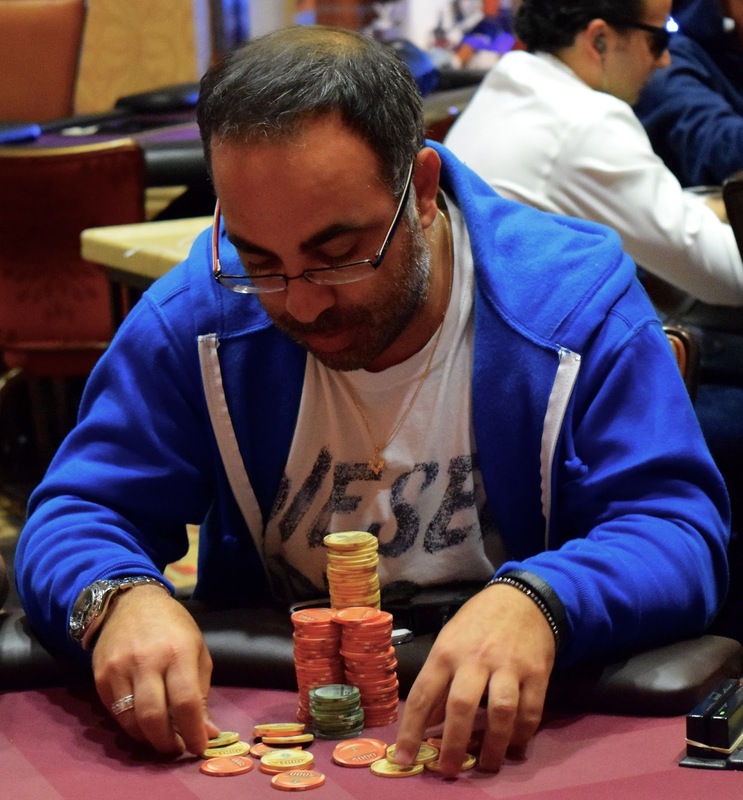 Adam Ghattas opens, there is a reraise for 420,000 from Minh Nguyen and Ghattas moves all in. Nguyen asks for a count - 1.2 million is the count - and Nguyen starts doing some chip-math as he debates a call, but decides to slow-fold his cards. The remaining 6 players in the @HPTPoker Main Event have headed off on their second 15-minute break of the day. We'll have updated chipcounts for you before cards go back in the air. Tom West bets out preflop to put David Carey all in for 625,000 and Carey agrees. Tom West moved all in preflop on two consecutive hands, everyone folded and he added almost 30 percent to his stack, getting back close to a milly now. Nic Vu moves all in for 945,000 on a 4x3♦️5♦️ flop and Adam Ghattas makes the call. The turn is 7♥️ and the J♠️ gives Vu the double. David Carey's trip 2's bests the 2 pair of Adam Ghattas and Carey gets a full double-up. I gotta get closer to the action so I can give y'all better chip-updates. First time we've seen Nic Vu get really active today, and shoving for 885,000 is as active as you can get. Blinds are going up to 30000/60000 with a 10000 ante, with 8 players remaining in the Main Event, a 15-minute break coming after this hour-long level. Yep, the small blind is now the same size as the players' starting stacks on Day 1. A shortstacked Daniel Hatch is all in and Tom West makes the call. David Carey is all in for 435,000 and Minh Nguyen makes the call. The board runs out 2♠️Q♥️2♣️6♥️J♦️ and Carey doubles. Tom West is all in for his tournament life and David Carey makes the call. The flop is 77K, with a 3♥️ on the turn and the 9♥️ gives West the double, we couldn't hear the chipcount but he was all in the previous hand for around 600k. There's been 4 all-in-and-a-call so far, and the short stack has doubled each time. 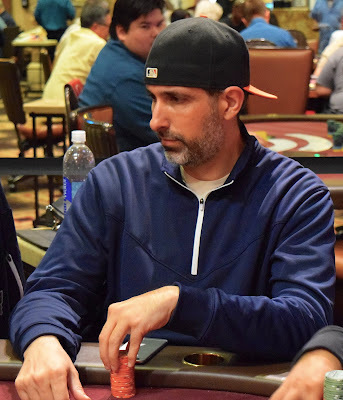 Doron Shako moves all in for 315,000 and Daniel Hatch moves all in also. The flop is T♣️A♥️3♦️, while the 8♠️ turn doesn't change things. The river 5♦️ gets a full double for Shako, leaving Hatch fairly short now. We are away from the table, unable to see a good view of chipstacks so counts are a tad tough. Smith checks, Nguyen checks, Ghattas bets 225,000 and takes it down. that was the biggest action since returning from break, folks, other than Tom West moving all in preflop and everyone folding. 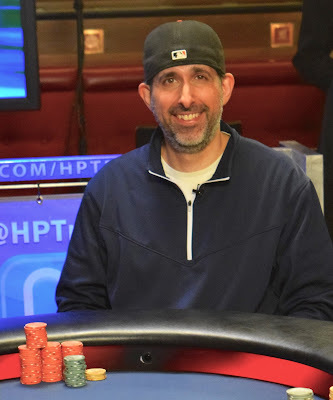 Here are the updated chipcounts on first break of the @HPTPoker Main Event final table, with Adam Ghattas (pictured above) the chipleader. The nine @HPTPoker Main Event Final Table players are on a 15-minute break. We'll try to get updated chipcounts for you on break. Craig Gold moves all in for his last 565,000 and Adam Ghattas makes the call. Gold gets a boat and gets 565,000 more in chips plus the blinds and antes. Tom West bets out 200,000 on a Q♥️7♥️9♦️ flop and David Carey moves all in for his last 575,000, with West making the call. The turn 3♦️ misses Carey but he catches the 8♥️ on teh river and doubles up. We stay 9-handed. Tom West bets and Minh Nguyen hesitates a bit, then asks West how many chips he has behind. Nguyen has a few things to say quietly (we can't hear what he's saying) and after about 20 seconds more he looks to Wil The Dealer and Jeremy The Tournament Director and announces all-in. West quickly lets go of his cards. We watched Nguyen play last weekend's $200,000 guarantee final table (he won the event for a $48,000 first prize) and he did something very similar .. same movements, actions.. got a call and showedAA ... we didn't get to see this hand. Craig Gold moves all in from UTG+1, and it folds all the way around to ... everyone, Craig gets the blinds and antes. Now playing at 20000/40000 blinds and 5000 antes, still 9 remain. 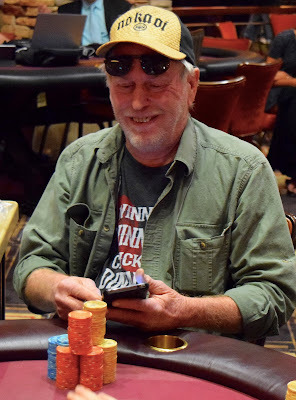 Play has been a bit slow and methodical here at the final table, but just now Randy Smith 3-bet to 275,000, only to see Adam Ghattas reraise Smith all in from the 9 seat. Smith thought for a few moments, and then released his cards to the chipleader. Here are the 9 players at today's @HPTPoker final table. (Front row, from left) Tom West, Minh Nguyen, Doron Shako, Adam Ghattas. (Back row from left) Nic Vu, Daniel Hatch, Randy Smith, David Carey, Craig Gold. Here is the new HPT bracelet the winner receives here at Thunder Valley, and all HPT Main Event winners now receive a bracelet. Getting ready for today's @HPTPoker Main Event final table. Here's what everyone has to start their day. LiveStream has Tournament Director Jeremy Smith on the mic, no backroom commentary. Ready for the Final Table? 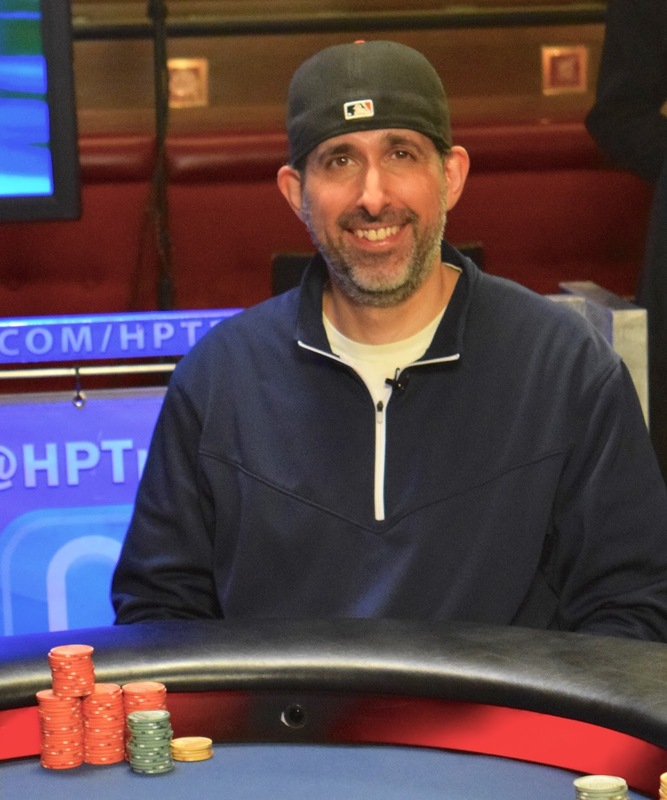 The @HPTPoker Main Event final table kicks off a bit after 1pm today, with LiveStream coverage on a 20-minute delay. You can watch all the action right here. Here are the results for all events in the 2015 Players Championship Series. Here are the results from Event 13 - $100 with $25 Bounties - in the 2015 Players Championship Series. Here are payouts in 10-18th place today in Event 10 - $1650 HPT Main Event - in the 2015 Players Championship Series. Here are the seat assignments and chipcounts for Monday's @HPTPoker Main Event final table. Cards go in the air at 1pm, with the LiveStream starting about 20 minutes afterwards. Here are the payouts for the final table of the @HPTPoker Main Event. 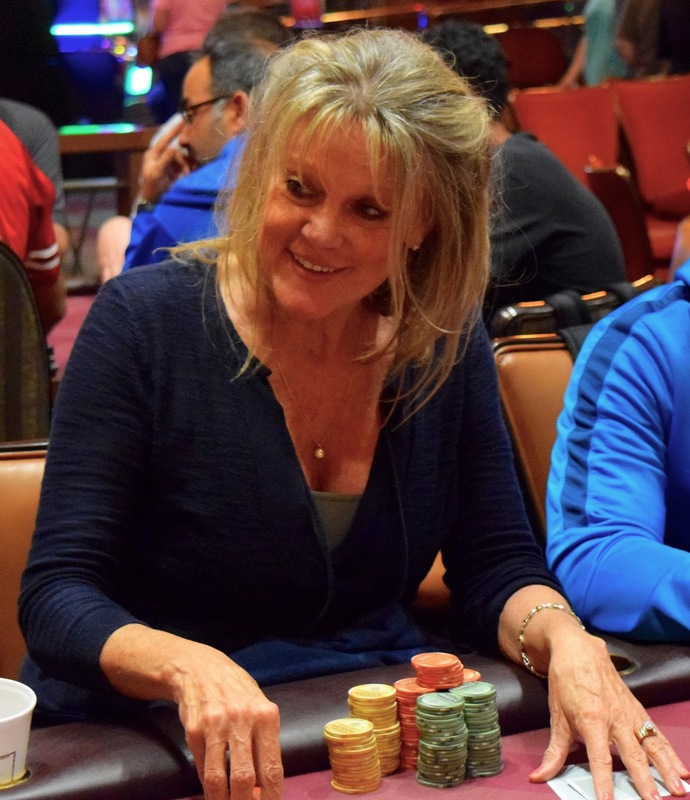 There's a raise to 75,000 preflop and four callers, including Valerie Hanley and Adam Ghattas. 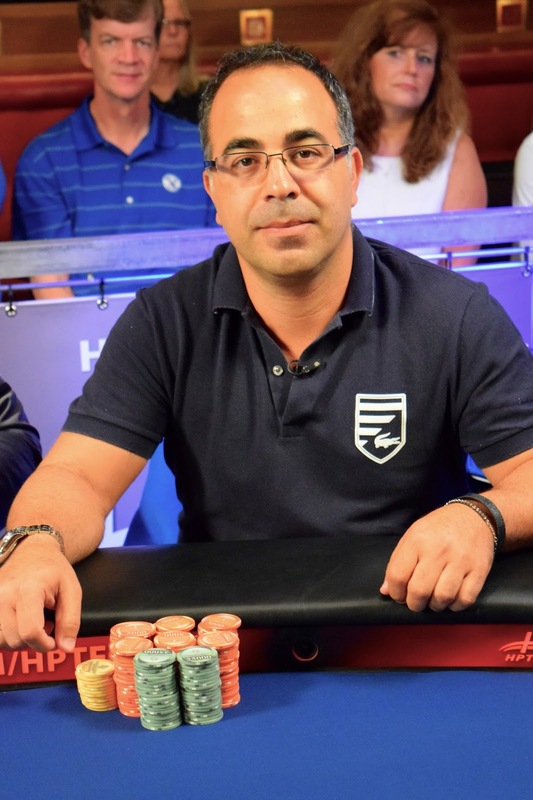 With a 250,000 bet on the 5♠️2♥️8♦️ flop from Ghattas, only Hanley comes along. The 4♠️ turn gets a 350,000 bet from Ghattas and another call from Hanley. Hanley jams the 7♠️ river for her last 414,000 and Ghattas waits until there is a full count .. and makes the call, having Hanley covered. ... and we're at tomorrow's TV Final Table, while Hanley finishes in 10th, cashing for $10,888. Here are the seat assignments and unofficial chipcounts for the unofficial final table in the @HPTPoker Main Event, including chipleader Tom West, with 2,350,000. Jaime Ronas is all in with KT against the K6 of Doron Shako on a K6x board. No T appears on the turn or river and we are now at the unofficial final table. Seat assignments and chipcoutns coming in a few moments. Robert Mitchell is all in for his tournament life and Minh Ngyuen has nim slightly covered, and makes the call. There is a K in the window and that's all she wrote. Mitchell is eliminated in 13th place, earning $8,133. Here are the results from Event 12 - $280 Survivor - in the 2015 Players Championship Series. Just 13 remain, 4 away from the unofficial final table, and 4 eliminations away from the end of the night. The final 9 come back at 1pm tomorrow to play in the Red lantern Restaurant where the HPT crew is filming the entire table and it is being LiveStreamed right here and at hptpoker.com (no backroom commentary, TD Jeremy Smith is on the mic brining you the action). Here are payouts in 19-27th place today in Event 10 - $1650 HPT Main Event - in the 2015 Players Championship Series. Nic Vu is all in for 431,000 and Nadav Noy makes the call, having him covered. The flop of 2♠️7♣️6♣️ does little for VU but add a backdoor flush draw. The turn A♣️ gives Noy a set but it also completes half of that backdoor draw for Vu. Noy yells and slaps the felt hard when the T♣️ lands on the river, finishing off the flush, doubling Vu and leaving Noy with about 105,000. There's a ton of chips in the pot preflop, again, between Minh Nguyen and Valerie Hanley, and more go in on a flop of T♦️T♥️Q♠️. Hanley leads out for 100,000 and Nguyen announces all-in. Hanley pauses, stares, looks at her chips and then reaches for all four stacks and slides them in to make the call. Nguyen stares, almost in disbelief and says "good call," as he turns over AJ. Here are chipcounts for the remaining 17 players as Level 24 begins, blinds of 12000/24000 and antes of 3000. Once we said play had slowed, the players accelerated play and we had a few bustouts in a row. 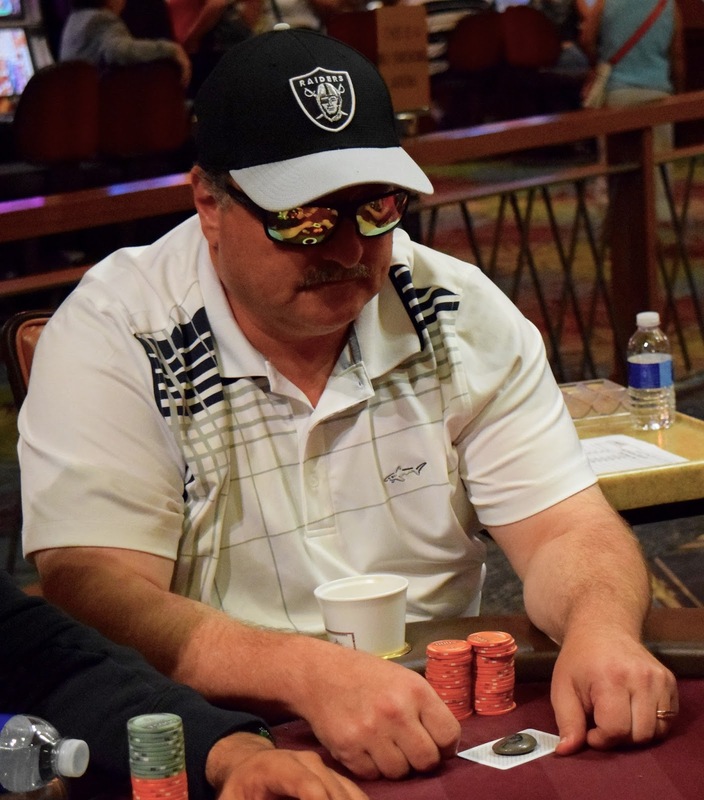 We're down to 2 tables now and right as we move to 2 we lose Steven Geralis 18th place, so we have one 9-handed table and one 8-handed table. We'll grab chipcounts for you as players are going on z 15-minute break. OK, so we needed to slip in this semi-ok picture from tonight's lunar eclipse .. now back to the pokers. A few players busted out fairly soon after dinner break, but play has slowed considerably here in Level 23 - blinds of 10000/20000 with 3000 antes - as players position themselves to move up the pay ladder and try to be one of the nine playing on TV tomorrow at the HPT Main Event Final Table. Final Table play begins at 1pm inside the Red Lantern Restaurant here at Thunder Valley. Come out, have lunch while watching the action, or watch the LiveStream commentary right here. There are 97 entries right now in the final event of the 2015 Players Championship Series, the $100 with $25 bounties, and there's still 55 minutes left to enter. Cord Garcia - the WSOP Colossus champion - finished in th place here today. 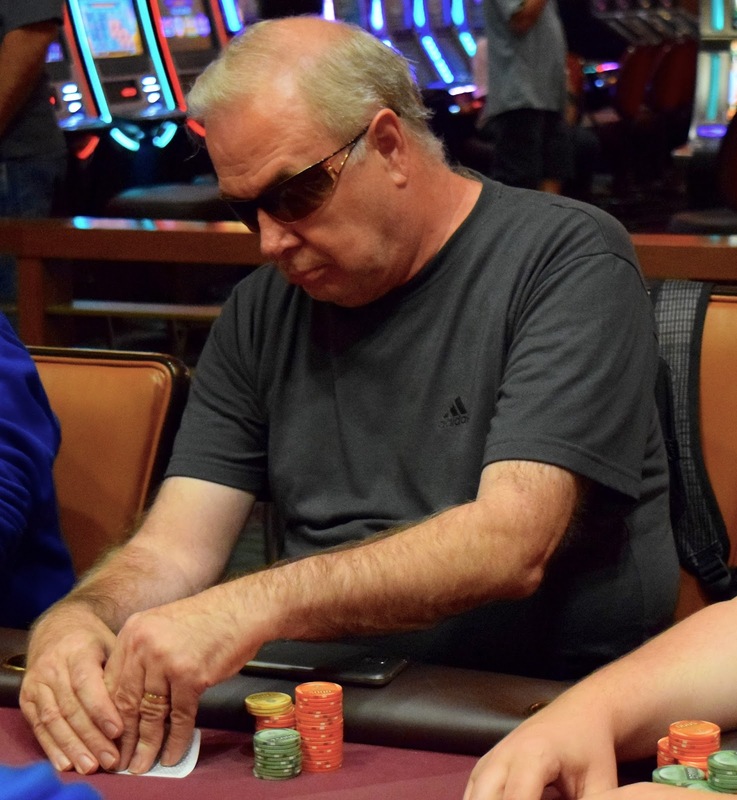 Steven Geralis didn't get Garcia during Colossus, but he's still going with 23 remaining today in the HPT Main Event. Geralis was one of the first names to catch people's attention when the largest-ever poker tournament took place at this year's WSOP. Geralis finished Day 1C as the overall chipleader, building his 5,000 starting stack up to 159,000. 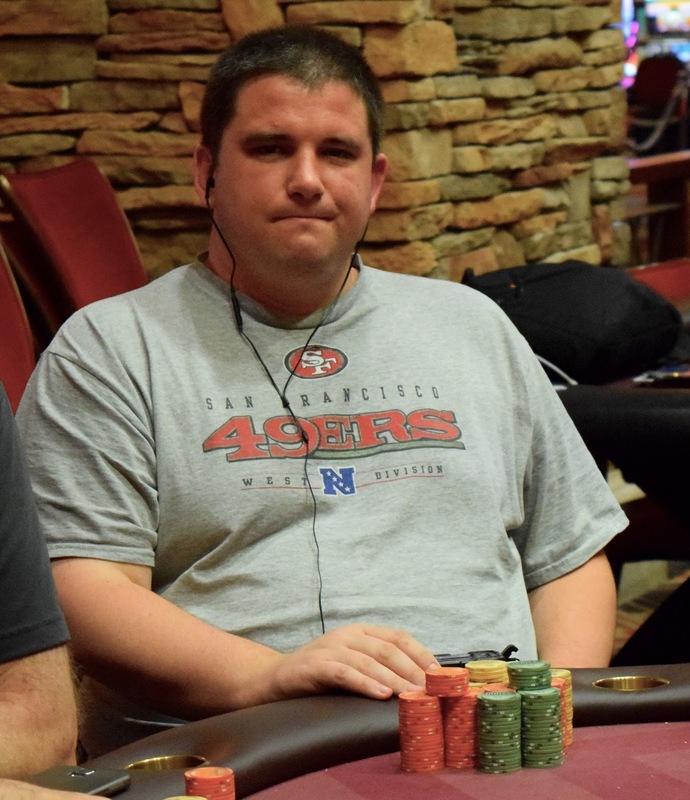 "There's a long way to go, so I'm not trying to get too high right now," Geralis told PokerNews after he wrapped up his first Colossus day. "It feels good to have the opportunity to possibly win some serious money." 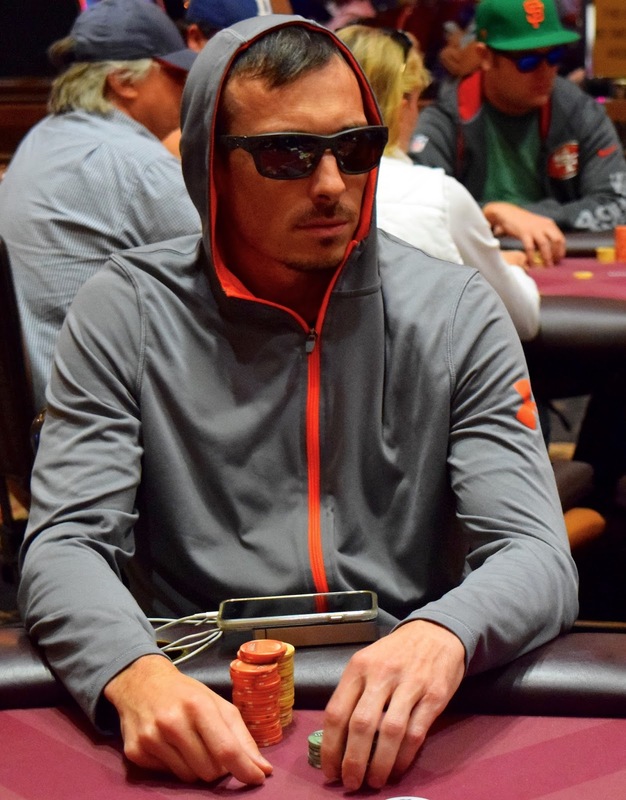 Geralis finished in 509th place, cashing for $5,000 while Garcia went on to collect more than $600,000 for the win. 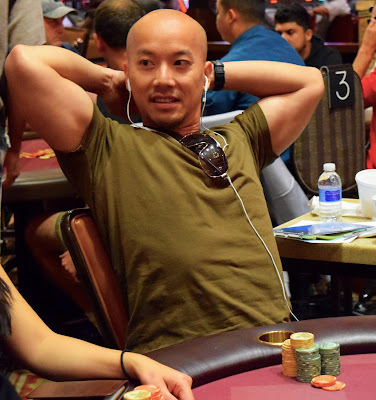 Geralis also has something in common with chipleader Minh Nguyen, as both are former champions in the $425 DeepStack that kicks off four different series' ehre at Thunder Valley. 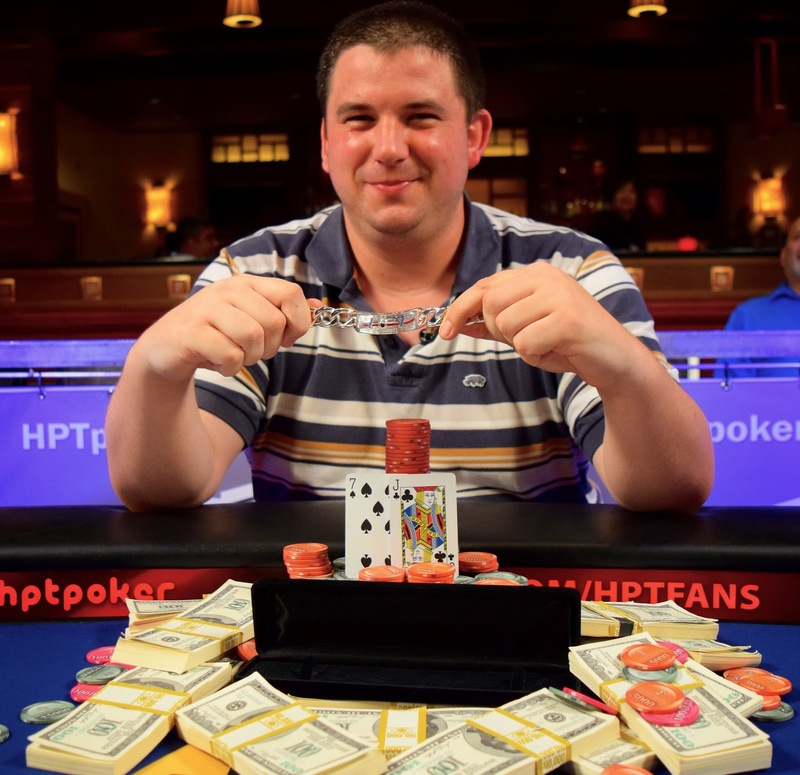 Geralis won the August 2013 Players Championship Series $425 for $42,000, his biggest cash to date. Here are payouts in 28-36th place today in Event 10 - $1650 HPT Main Event - in the 2015 Players Championship Series. Valerie Hanley got the best of Minh Nguyen for a few hands, and they are back at it on a QT4 flop. By the time we get down to the river, Nguyen is all in for 770,000 and Hanley makes the call, having him covered. Craig Gold moves all in and gets a call from Anthony Spinelli for what looks ot be pretty even stacks. 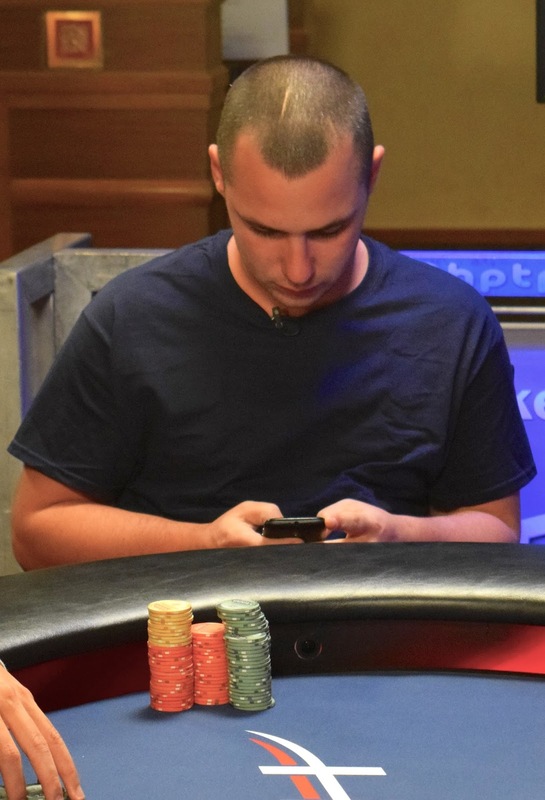 No Ace shows, and with a countdown of chips, Spinelli is left with just 4 antes, and he is eliminated on the very next hand in 26th place. Here is the redraw for the final 27 players. We didn't make the redraw before dinner break. 28 players remain and they are off an an hour-long break. Who Has a Milly or More? Four players have crested the milly-mark with 28 left and 8 minutes until dinner break. HPT Sideline Reporter @DreaRenee_N catches up with Thunder Valley Main Event chipleader Minh Nguyen. Here are the payouts for Event 12 - $280 Survivor - in the 2015 Players Championship Series. 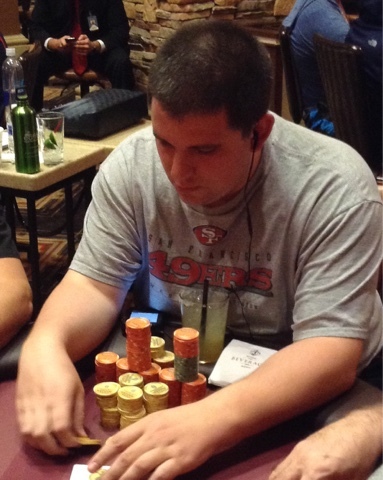 2014 HPT Thunder Valley champion Ezequiel Fernando has been eliminated in 38th place. One more hour until dinner break for the 33 remaining players in the Main event as they now move to Level 21. Minh Nguyen continues to send players to the rail, this time knocking out Cary Marshall (5th place here in the Ante Up World Championships last month) when his 55 flops a set against the AT of Marshall. Here are payouts in 37-45th place today in Event 10 - $1650 HPT Main Event - in the 2015 Players Championship Series. Tom West calls the all in of Kfir Nahum for 202,000 and the cards are turned up. No Ace shows for Nahum and the 2015 Bay 101 Open champ is eliminated in 36th place while West - 3rd place in the HPT Main Event here last January for $64,000-plus, moves to 2nd in the chipcounts. 1 table 2 we hit 27 players. 36 remain in the Main Event, a redraw at 27. HPT Sideline Reporter @DreaRenee_N caught up with WSOP Colossus winner Cord Garcia before his Day 2 exit in the Main Event here today. 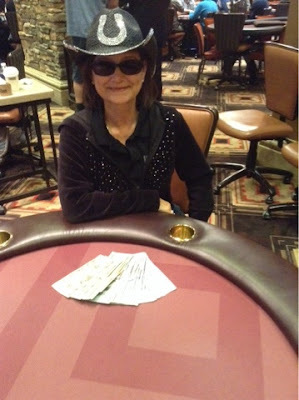 Garcia cashed in 41st place for $3,159. Here is sideline reporter @DreaRenee_N as she catches up with @HPTPoker Reno Main Event FTist Robert Mitchell during Day 2 play here at Thunder Valley. Those two green stacks - not even counting the other 9 atop - make up 300,000 more in chips than anyone else's entire stack today. Those two greens = a cool milly and belong to Minh Nguyen. Here are chipcounts from across the field with 42 players remaining as the second 15-minute break of the day kicks in. Players return to Level 20, blinds of 5000/10000 and 1000 antes, plus the introduction of the green 25000 chips. Minh Nguyen gets almost all of the greens. The final event of the 2015 Players Championship Series, Event 13, a $100 with $25 bounties, goes at 7pm tonight. 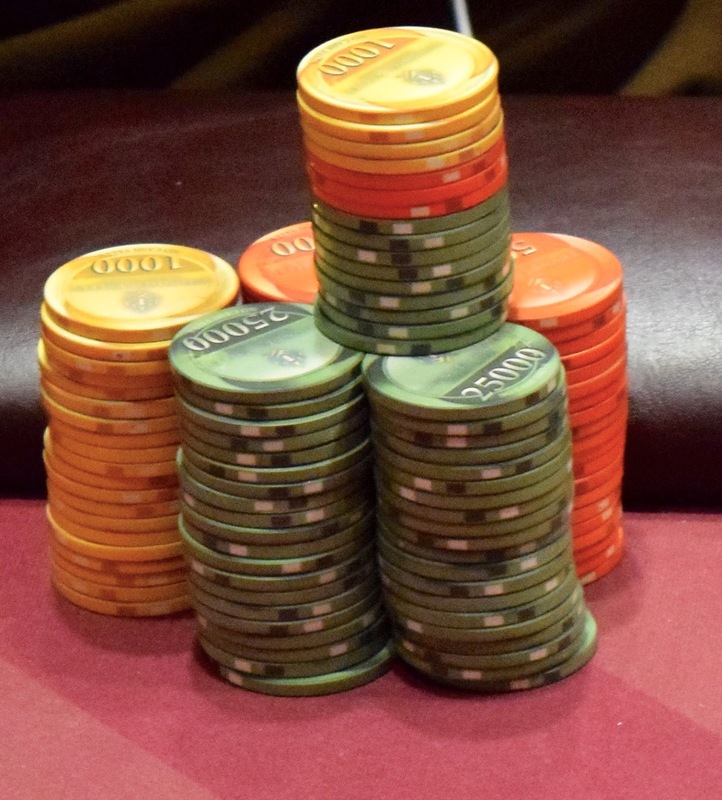 Players start with 6,000 chips and play 20-minute levels in the no-ante event. Late registration in this 1+1 event (one entry, one re-entry per person) closes when cards go in the air to start level 5. Here are payouts in 46-54th place today in Event 10 - $1650 HPT Main Event - in the 2015 Players Championship Series. Matthew @biggerbreadbox Dillon and chipleader Minh Nguyen see a flop of 7♦️T♦️2♠️. Nguyen bets 65,000 and Dillon moves all-in for 239,000, sending Nguyen into the tank for almost two minutes before making the call. The board doesn't produce the gutshot 8 for Dillon and he is eliminated in 44th place, cashing for $3,159. "I was getting bullied and I had to take a chance," said Dillon as his day ended. 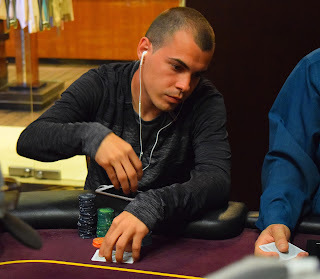 Cord Garcia flops a set, running in to top pair and 2nd nut flush draw of Dan Barker. Barker gets there on the turn, cutting Garcia down to 88,000 chips. Barker moves up to 454,4000 with his double-up. Jackie Wesley barely held on through the money bubble, down to only three antes .... she turned those 3000 chips in to $2,500. The flop is 5♥️4♦️5♠️ and Ronald Wu is already all-in, with Jaime Rones and one other player continuing the action down to the turn (7♠️) and river (J♣️). Rones flopped a boat and that was the end of that story, and of the money bubble. Wu is out in 55th, one shy of the money. 12 hands in and the 55 remaining players are still on the money bubble. Cord Garcia bet 22,000, Nguyen 3-bets to 55,000, Garcia 4-bets to 84,000 and Nguyen releases. Minh Mguyen 4-bets all-in against Cary Marshall. Timmons doubles, Triet Nguyen doubles, the AJ's chop and Marshall folds. 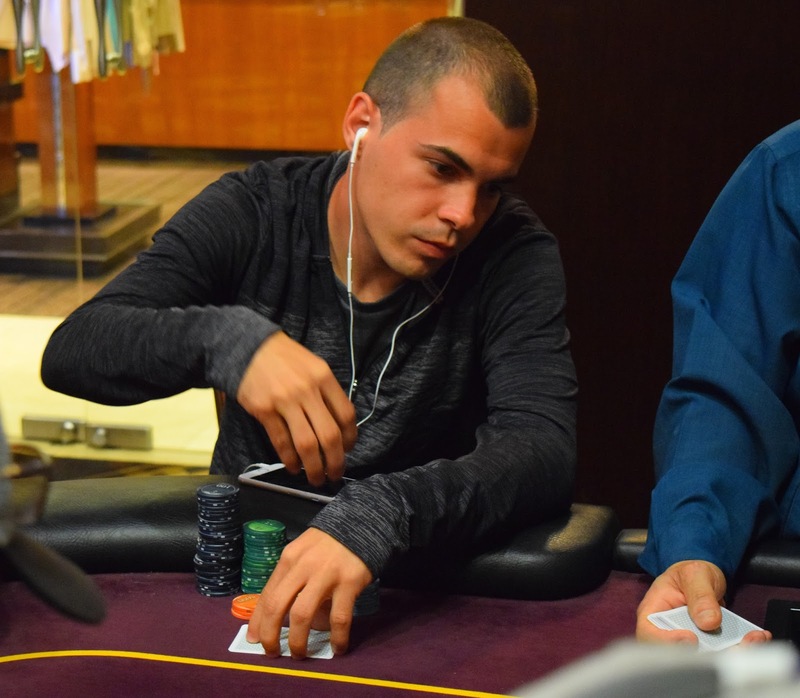 Two unventful hand-for-hand plays, then Greg Guth and Anton Dimagiba mix it up with a 35,000 preflop raise from Guth and a call from Dimagiba. The flop is A♠️T♥️T♦️ and Guth jams his last 82,000 ... Dimagiba folds, and hand-for-hand continues ... nothing on the next hand either and we are on to the 5th hand. 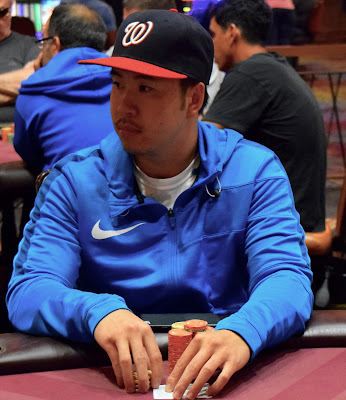 Jeff Wakamiya is all-in for his tournament life with AK against his opponent's 88 and the 8's hold, sending Wakamiya to the rail four shy of the money. Here's what happened to a few of the players as they busted short of the money on Day 2 of the @HPTPoker Main Event. We'll let them tell you themselves in 140 characters. Busted @HPTPoker ME @TVPokerRoom 60th. Put my last 7bb in w KJ and ran into AK. Good luck to those still in. Out in 61st of 464 in @HPTPoker main event @TVPokerRoom. Seven short of $. Was extremely short-stacked shoved Ac6c from SB. BB woke up w/AA. Event 12 of the Players Championship Series is a $280 Survivor tourney, where the top percent of the field all cash for $2,500. There are 37 entries after level 1, with late registration open until level 5. Play began at 1pm, players start with 10,000 chips and play 30-minute levels. Duke Lee, winner last week's HPT Main Event in Reno, has been eliminated before reaching the money. Here are some chipcounts from across the room on first break of Day 2 in the HPT Main Event. The 62 remaining players have headed off on a 15-minute break, just 8 eliminations away from the money. While we were watching action at Dan Stir's table, JC Tran was eliminated from the HPT Main Event before reaching the money. Dan Stir and his opponent have almost 300,000 in the pot preflop and are taking a look at the flop of T♠️T♦️4♦️. Stir puts his last 170,000 out in front of him and his opponent goes deep into the tank, counting out a total of 210,000 - just 40k left behind with blinds of 2500/500 if he calls and is wrong. "Show me if I fold?" he asks, and Stir doesn't stir. About 90 seconds later, KK goes face up into the muck and Stir goes to 490,000 chips. Players are now in their second hour-long level of the day and the board shows 80 remaining, 26 to the money. Stan Jablonski is all in and called - and covered - by last weekend's $200,000 guarantee champ Minh Nguyen. 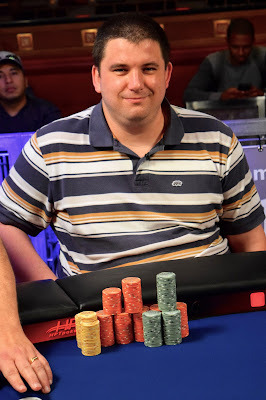 The flop and turn do nothing to change the action, but a K on the river eliminates Jablonski. 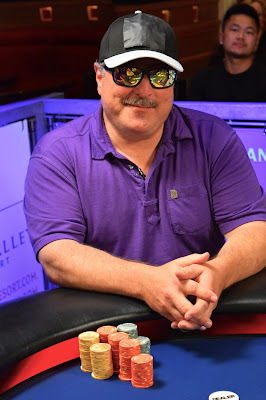 Paul McCaffrey finished fifth last weekend in the $200,000 guarantee here at Thunder Valley, joking before the LiveStreamed final table began that he didn't want to be shown because his wife didn't know he was playing. I wonder if she is reading along now to learn that Paul just knocked Joe Barry out of the HPT Main Event, chipping up to 356,000? We arrived after action had completed, but 2004 WSOP Main Event champ Greg Raymer has been eliminated from Day 2 of the HPT Main Event before reaching the money. Cary Marshall leads out on a J♥️8♠️Q♥️ flop and Brent Bruno moves all in. Marshall announces a call and shows K♦️T♦️ for an open ended draw. Bruno just stares and slowrolls over A♠️Q♦️. The turn 8 gives Bruno two pair but the river 9♦️ completes Marhsall's straight and Bruno is out in 93rd place.